My 13 year old is going on a field trip this week to a museum in DC and because buying food at the museum is cost prohibitive, I’m packing his lunch. This is new territory for me because under normal circumstances our kids don’t bring a packed lunch – they buy lunch at school. I carry a little guilt about this since my mother usually packed my lunch when I was a kid. In a plastic lunch box or brown paper bag I could expect either a turkey, baloney or peanut butter sandwich, a Hi-C juice box, an apple and/or carrot sticks, some type of snack cake, and once in awhile, a note written on my napkin telling me how loved I am. This lunch is different from what I pack for Carlos – arroz con albóndigas, tacos, escabeche, galletas María, semita de piña … I can’t pack these things for my 13 year old, can I? Sure, he eats them here at home but – in public? Around gringos? … I think about a story I read on TikiTikiBlog.com about what it’s like to bring “ethnic” food for lunch when your gringo classmates bring “normal” things. The dreaded grade school lunch trade – when my ethnicity was undeniably made public, with the contents of my lunch making who, and what, I was unmistakable. I wanted to blend in, to be one with the bologna and mayonnaise sandwich crowd, the chocolate chip cookies, the plastic bottles filled with Sunny-D. But nothing screamed “Not One of Them” louder than my sliced white goat cheese and Goya guava jelly sandwiches, with a chunk of pineapple thrown on top for extra Latino measure. Oh the squeals and screams of the other non-Latino children as they recoiled — as if watching a horror movie. This is what I don’t want my son to go through – although popular and well-adjusted, he already deals with people asking him if he’s Mexican and if he’s related to George López. And so, while at the grocery store picking items for his lunch, I stood, feeling kind of torn, in the middle of the aisle – a bag of all-American Cracker Jack in one hand, and a bag of plantain chips in the other. He likes both equally. Do I strengthen his identity or allow him to blend in? I decided I would buy both and let him choose, but I couldn’t wait until I got home to find out which he would take in his lunch. I put the bags into the cart and texted him. 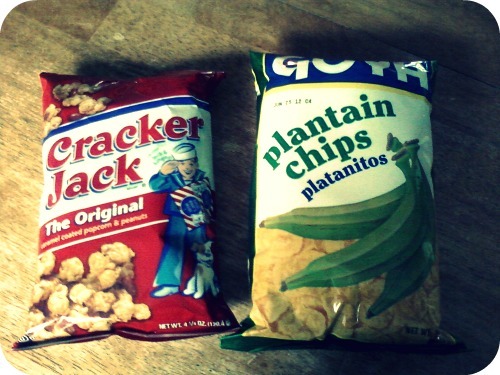 Field trip snack – Cracker jack or plantain chips? Thirty seconds later, he texted back. I found myself smiling – but does this mean anything? Maybe, maybe not. Maybe it means he’s confident in who he is. Maybe it means I’ve done a good job of instilling Latino pride into my boy. Maybe it means he’s not worried about trying to fit in and refuses to succumb to peer pressure… or maybe it means he’s just in the mood for plantain chips. I have to say though, he asked if he could pack a semita de piña as well and I won’t pretend I’m not happy about it. This post makes me think about how my cousins got laughed at for bringing kokiel mogiel to school. Which is basically raw egg mixed with sugar and chocolate. I loved that stuff as a kid but it earned them some weird reactions, let me tell you. Its a Polish thing. As an adult I think its kinda gross, but I loved it when I was a kid. Hi Tracy. This is Ulysses. I just can say that you are a really good mother because you has tried to make a balance between two culture. I think when your kids become older, they will be absolutely proud themselves feeling sure themselves. GOOD JOB MOMY. Thanks, Ulysses :) That is a sweet thing to say. Can’t find this word “semita” anywhere. What does it mean? Thanks, dinita, the connection was what I suspected but the reason was missing. Its wonderful that your son is confident. There will undoubtedly be times when he feels less so, but i survived and so will he :) Food is a good area in which to share his culture and built his pride in it. my sisters and I passed our childhood *horrified* by the lunches we took to school. If it wasn’t rice and beans, it was tamales, ceviche de soya or just marias and fruit if things were tight. I i just wanted to have oreos, or chetos or a ham sandwich. My mom simply couldn’t afford to spend money on food that didn’t help feed us substantially, entonces, no junk food, just our normal food. Aww..I am so flattered, and honored. This is my dream, for my life: to have my words help others to feel less alone, less different. It’s what I work for every day. I have a collection of essays, for Young Adults, on growing up different, that I hope to one day find a publisher for. How I could have benefitted, have my life changed, by feeling accepted. Thanks so much, Alexandra. Your stories are really special to me, as the mother of children growing up half-Latino in the U.S. your writing has added value for me, but I also just love them simply as someone who loves a good storyteller – which you are. I hope that your essays are published in time for my kids to be able to read them. Besos! This brings me back to the liverwurst sandwiches my mother made for me in elementary school. No one wanted to trade with me, that’s for sure. As one of the only children in town with parents with strong accents, no one was surprised. I have a friend who requests plantain chips in every care package I send. When they arrive crushed (three times out of four), she uses them to top green beans. Delicious either way! Nice writing. He picked the platanos for some unknown reason. Your take is great, but be proud. It’s clear that he is not conflicted about his choice. BTW, we are kind of new to your blog, but we like it. Why? Nice writing and nice topic. Que divertedo. My grandmother, who only went up to 1st grade, told me how she and her brothers used to hide in the back of the school to eat their bean burritos and then she said “pero ahora los gringos se mueren por comerse un burrito de frijol!” LOL I guess the more things change the more they stay the same. Your sons are proud of their heritage and their culture. Embrace that! I think they are both strong enough to say “Hey, this is me!” and you shouldn’t be afraid that they will get teased or talked about because of the food they bring. =) Last Sunday I made pupusas for some odd reason my hijo no quiso and told me to pack them for his lunch the next day. I found myself thinking, hmmm I wonder what his little friends were going to think since none are Latinos. i didn’t want him to have to explain to other 5/6 yr olds the whole “poo poo”sa part. I almost felt tempted to tell him if the kids asked to tell them they were quesadillas (as in the mexican ones) then i realized what i was doing and packed them anyways. When I moved further south growing up, i found myself explaining myself A LOT!! I didn’t want my kid doing the same. After thinking about it though i rather them explain themselves then deny what we are! Love plantain chips!! Have you tried the sweet ones? Glad you ended up packing them and not changing the name.